AmericaSpeaks: Our Budget, Our Economy was a national discussion to find common ground on tough choices about our federal budget. On June 26, 2010, 3,500 Americans from across the country came together to weigh-in on strategies to ensure a sustainable fiscal future and a strong economic recovery. As a part of this national discussion, simultaneously participated in an unprecedented National Town Meeting. 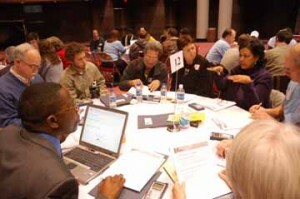 Why did we convene a national discussion? As a nation, we need to come together to put our country on a sustainable path by setting national priorities and making decisions about how we are going to pay for them, to ensure that our nation continues to invest in national priorities. We’ve gathered information and resources on the topic here. How was this National Town Meeting different? This National Town Meeting simultaneously linked all the meeting sites and online participants across the United States, all on the same day — June 26. It educated the American public about the challenges facing our nation, provided Americans with a neutral space to explore the issues and weigh the trade offs, and delivered to political leaders in Washington a clear message about the shared priorities of a large, demographically representative group of Americans. Since the National Discussions have ended, we will provide Americans with resources to stay involved and let their voices be heard. Read a blog post by Carolyn Lukensmeyer, the President of AmericaSpeaks, on how this discussion is unique. Where did the National Town Meeting happen? The National Town Meeting took place in nearly 60 sites, including 19 AmericaSpeaks 21st Century Town Meeting locations across the country, 38 Community Conversations, and online. All of the town meeting locations were be linked together by live satellite, webcast, and interactive technology. You can see the site reports for the 19 Town Meeting locations here. AmericaSpeaks, a nonpartisan, nonprofit organization with the mission to reinvigorate American democracy, convened the national discussion. The national discussion was made possible by the generous contributions of our funders. A diverse group of experts and advocates formed our National Advisory Committee. In addition, dozens of organizations in cities across the country have endorsed this project and lent their support as local outreach partners. AmericaSpeaks and our partners — and the thousands of people who participated in the national discussion — worked together to ensure that the values and policy priorities we agreed on were heard and taken seriously by decision-makers in Washington. AmericaSpeaks presented the priorities that emerged from the national discussion to Congress and President Obama, as well as the National Commission on Fiscal Responsibility and Reform and the Bi-Partisan Policy Center’s Debt Reduction Task Force. We’re working with participants, as well as our local and national partners, to continue to educate the public about the challenges facing the nation and to raise awareness about the national priorities that were produced through the discussions. Click here to read the results presented to Congressional Leaders. Individuals and organizations will continue to have access to an array of tools to stay involved, ranging from writing letters to the editor to facilitating conversations to taking action in their communities. If you have questions, contact us here. For media, please see our Press information.